Every year, we issue a report to sum up the work that we’re doing and thank our supporters. You can access the full Annual Report as a PDF here. 2017 was a big year for us! It was the year that Carolina Mountain Land Conservancy and Pacolet Area Conservancy merged to form Conserving Carolina. In the Annual Report, you can find a full list of our 2017 donors. Your donations make it possible for us to protect this amazing part of the world! 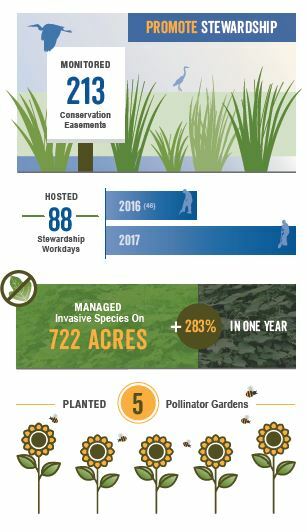 The infographic in the sidebar gallery sums up our impact in 2017. 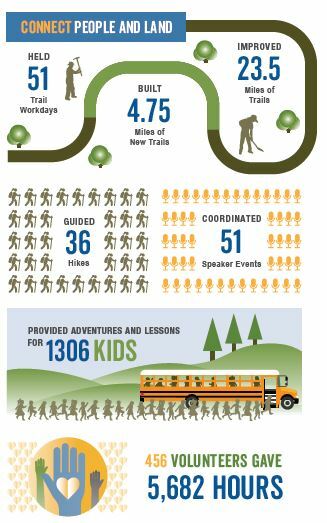 You can find the full size infographic in our Annual Report, along with other resources including a map of conservation lands that showcases highlights from the year—like the Wildcat Rock Trail, Bearwallow Summit, Little White Oak, Youngs Mountain, Pleasant Grove, the home of Mother Earth News, and land that adds to Pisgah National Forest. 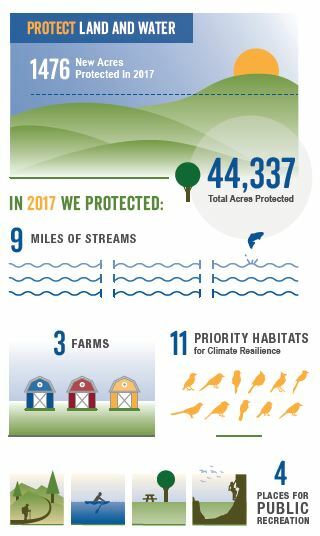 We have now protected over 44,000 acres! The Annual Report showcases a few stories of the people who help us do so much. Like volunteer Duane Bowker who comes out to almost every stewardship workday we hold, cutting back multiflora rose and privet or pulling up Paulownia. He’s so dedicated that he wore out his loppers and his wife got him a new pair for Christmas! 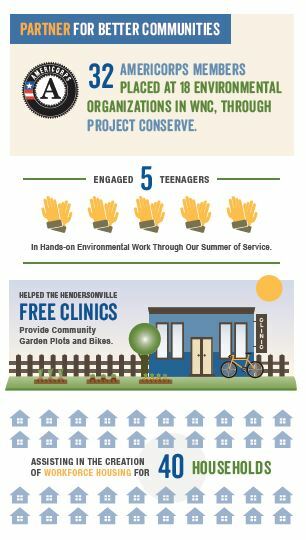 Or like the young adults who participated in our first ever Summer of Service. 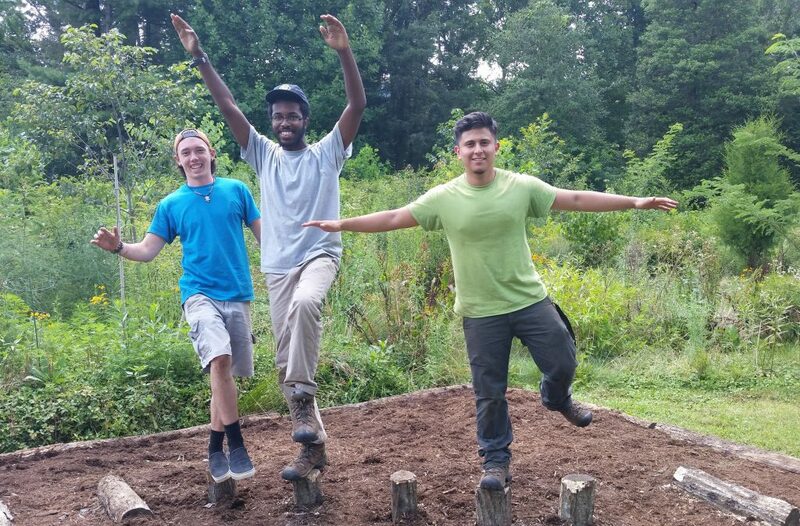 Here, three of them—Jordan Kirkland, Jason Brandyburg, and Fernando Baruch—try out the nature playground they created for the Child and Family Resource Center. In the Annual Report you can find our Financial Statement, which shows how we are funded and how we use those funds. 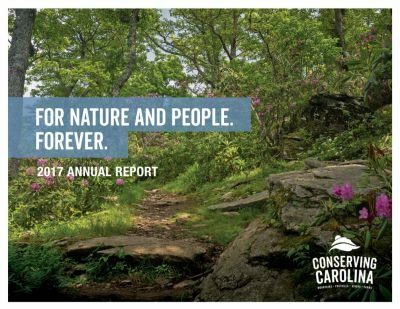 The report also recognizes our supporters, including conservation landowners, Summits Society major donors, Land Legacy League members who are supporting us through planned giving, and Guardians of the Green business sponsors. We are truly grateful for all of our donors and all of the volunteers who make our work possible. Thank you!